What is Hibiscus Flower Extract? Hibiscus flowers offer more than just a decorative flair to your home or garden. The flowers boast multiple health benefits. They may help combat aging, strengthen the immune system and possibly alleviate cancer. A powerful antioxidant, hibiscus can also lower blood pressure, reduce cholesterol levels and more. Antioxidants protect your body from free radicals — harmful molecules that cause oxidative damage to your cells, leading to signs of aging and disease. Hibiscus flowers are rich in two antioxidants called anthocyanins and quercetin. In studies, these antioxidants reduced the harmful effects of oxidation by an incredible 92 percent (x). Research has linked anthocyanins to a lower incidence of chronic and degenerative diseases (x). Anthocyanins offer anti-inflammatory, anti-viral and anti-cancer benefits. Studies suggest that hibiscus tea increases levels of anthocyanins in the bloodstream. This reduces the buildup of compounds that lead to oxidative stress and diseases like cancer (x). Quercetin is a powerful antioxidant that reduces the risk factors of heart disease by lowering blood pressure (x). It may also help prevent certain types of cancers (x). If you have high blood pressure, try adding a hibiscus extract supplement to your nutrition routine. As a diuretic, hibiscus may clear up the arteries and inhibit the release of hormones that constrict blood vessels, thereby lowering high blood pressure (x). In fact, research suggests that hibiscus improves blood pressure even in those with existing health conditions that increase the risk of high blood pressure (x). Another study found that hibiscus tea was more effective than one of the leading pharmaceutical medications at decreasing blood pressure. Even better, unlike medication, hibiscus didn’t cause any adverse side effects (x). Hibiscus flower’s ability to lower blood pressure isn’t the only way it benefits your heart. Studies suggest that hibiscus flower extracts can naturally lower cholesterol and triglyceride levels in patients with metabolic syndrome (x). Moreover, hibiscus flower extract may lower blood sugar and lipid levels in those with diabetes (x). Research continues on the different species of plants and fruits that may fight cancers like leukemia. Hibiscus may be one of the leaders in this emerging field. A number of studies show that hibiscus extracts cause death of leukemia cells (x, x). Results from other studies also suggest that hibiscus tea extract stimulated cell death in eight different kinds of cancer (x). The antioxidants in hibiscus tea not only protect cells, but also promote weight loss in patients with obesity or at risk of obesity (x). Human and animal studies have found a correlation between drinking hibiscus tea and an increase in metabolism. Moreover, hibiscus extract may potentially inhibit the absorption of excessive starch and sucrose, stopping harmful spikes in blood sugar levels (x, x). Non-alcoholic fatty liver disease (NAFLD) is a condition in which excess fat deposits in liver prevent it from removing toxins in you blood. Linked to metabolic syndrome, NAFLD can progress to more serious conditions. Hibiscus could help keep your liver healthy, reducing the risk of NAFLD. Studies suggest hibiscus reduces the buildup of fatty tissue, which can potentially prevent cirrhosis, liver cancer or liver failure (x, x). If you’re depressed, stressed or anxious, a hibiscus supplement could help. Hibiscus flowers contain antidepressant properties that promote feelings of calmness and reduce anxiety. Studies indicate that it may reduce symptoms associated with depression, like fatigue, listlessness and irritability (x,x). Research suggests that a particular strand of hibiscus rosa sinensis may have significant potential to kill the MRSA bacteria (x,x). Hibiscus flower extract also functions as a diuretic, benefiting your urinary tract and kidneys. In fact, hibiscus flower extract may even reduce the level of compounds that lead to the formation of kidney stones, preventing them altogether (x). Hibiscus contains many natural properties that benefit hair and skin. For that reason, it is a popular ingredient in skin care products, lotions and shampoos. Rich in powerful antioxidants, hibiscus nourishes the skin and increases collagen production. This reduces signs of aging like wrinkles and sagging skin (x). Additionally, hibiscus leaves nourish hair and promote hair growth (x). The Ancient Egyptians drank hibiscus tea to lower body temperature, treat cardiovascular disease and relieve anxiety. In India, it’s a traditional remedy for diabetes and liver disorders. Hibiscus tea continues to play an important role in many religious and healing ceremonies. In Hinduism, the hibiscus flower represents the goddess Kali. The hibiscus is the state flower of Hawaii and the national flower of Haiti. As long as you adhere to the recommended dosage, hibiscus is safe to take for healthy adults. On the other hand, when it’s consumed in extremely high doses, it could lead to liver toxicity. Do not take hibiscus if you are pregnant or nursing since it may cause bleeding (x). Side effects of hibiscus are rare, but they may include digestive upset like gas, diarrhea or constipation, painful urination, shakiness, and ringing in the ears. Most importantly, hibiscus affects blood pressure, so talk to your doctor before taking it if you are prescribed blood pressure medications. 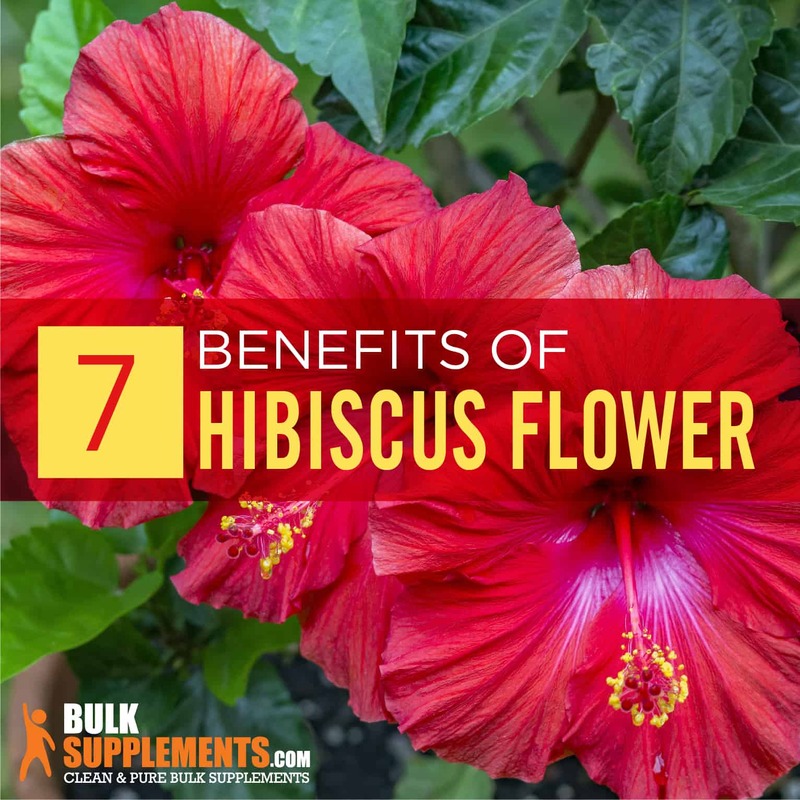 You can find hibiscus supplements in a variety of forms including pills, capsules and powders. Hibiscus flower extract powder possesses powerful antioxidant properties. If you choose the powder, take 800 mg once daily, or as directed by your physician. Moreover, you can mix the powder into a smoothie, juice or beverage of your choice. Hibiscus packs a serious health punch. In short, it could improve your heart health, boost your mood, aid in weight loss and more. With a long list of benefits and few side effects, its easy to see why hibiscus flowers are more than just tropical decorations.